“Brighter Families” promotional card game for Cosmos Lamps (Metropolitan Vickers), published in 1930, contains 8 families relating to Cosmos light bulbs, promoting their efficiency and longer life. As with many other British manufacturers of household products during this era, Metrovick published a considerable number of advertising backs for playing cards promoting their wares, as well as this full set of Happy Families cards. The ‘MV’ logo was subtitled “The Mark of Efficiency”. Above: “Brighter Families” promotional card game for Cosmos Lamps (Metrovick), 1930. 32 cards in box. Images courtesy Rex Pitts. 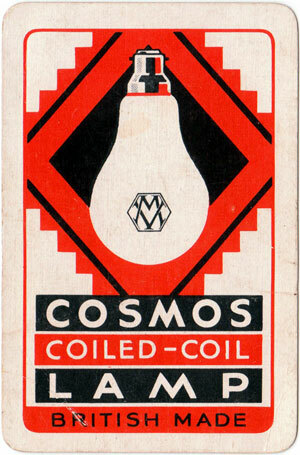 Above: advertising deck for Cosmos Lamps by Universal Playing Card Co (Alf Cooke), c.1939. Image courtesy Matt Probert.